On Monday, I found myself on the road in a "please go do this now" work event. This involved an afternoon in my Jeep and a late lunch. As it came time to procure said lunch, I was trying to decide what I wanted, what was it that would satisfy. When you're on the road, how do you determine what you're going to eat? You're driving down the Interstate at 70 mph. You've got a full tank of gas. (Insert Blues Brothers quote. You know the one.) You realize you're hungry. Thanks to our "enlightened" age, we no longer have to rely on faded billboards advertising diners at the next exit which the health department closed down 6 months ago. We have spiffy shiny signs put up by highway departments advertising chain restaurants with the same food you can get from Bangor, Maine to San Diego, California and every point in between. Depending upon revenue, that Burger King sign at exit 136B might be for the Burger King that went out of business 6 months ago, but the highway department hasn't had a chance to remove the placard. I thought about all of this, and more, as I pulled into my restaurant of choice on a Monday afternoon. I opted to eat at Culver's. This place was, essentially, foreign to me until, roughly, 9 years ago, when I was sent north into Wisconsin for a bridge job. There was a Culver's just north of the town where I was stationed, across a parking lot from the hotel where I was to spend the night. I knew nothing about this chain. It was, at that time, limited to Wisconsin. If you are unfamiliar with Culver's, they are a fast food with a large sit down area restaurant. Their specialty is the "butter burger". I'm not sure if they fry their hamburgers in butter or if butter is added to the meat as it's cooked. It has a taste that is reminiscent of burgers cooked over a backyard grill, summertime, with dad pretending that he knows exactly how to do this whole grilling thing that everyone assumes he can do to perfection. The advertising for Culver's stresses something we subconsciously take for granted. 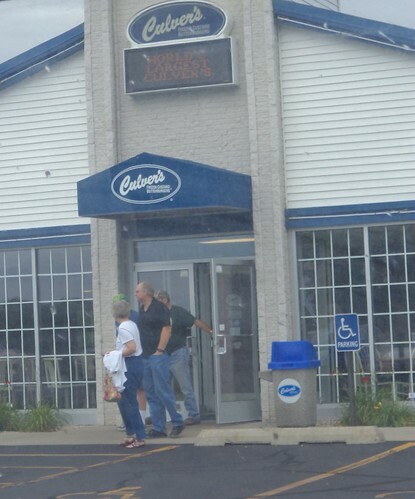 Culver's says that when you go into a Culver's, anywhere in the US, you will find the same high standards of food that you find when you're at your hometown Culver's. My food from this Culver's was the same as the Culver's close to me, same taste. I'm going to be doing a little traveling on my upcoming vacation. Part of that will involve being on the road during the hours when we usually sit down to meals. I've read some articles about how life changed, dramatically, when the US Interstate system was formally opened. It used to be that going from point A to point B involved a two-lane road with speeds of 60 mph, although that was usually only in the first few years of a highway's life. After it had been patched in several place, you might hit 55. To get from Cedar Rapids to Iowa City, you would have to drive through Ely and Solon or maybe go via North Liberty, Tiffin and Coralville. Growing up in Monona, I remember the drive-in at the west edge of town, just off Highway 18. It was a huge treat in the summer to pile into the car and go to the drive-in for dinner. You generally knew the waitresses. In fact, some of them might be babysitters to the kids in the car. The food was unspectacular but it was homemade from locally sourced ingredients. If you were traveling, there were thousands of these restaurants along the two-lane roads that crisscrossed the US and thousands more Jim and Joe's Diners, usually located in the downtowns of the towns through which you were driving. As the interstates came through, or rather, by towns, the local diners and drive-ins closed. They have been replaced by the McDonalds, the Subways, and yes, the Culver's of the world. There are pluses and minuses for this. On the plus side, I remember gas station bathrooms, oh lord do I remember those. The jokes about cleaning it every 6 months with a flame thrower weren't that far off. Now, when you have to go, for the most part, the chain eateries keep their bathrooms in a condition we'd never dreamed we'd find while traveling. You had to actually sit down at Jim and Joe's to use the bathroom, although, in small towns, they seemed to understand that parents with 4 kids just needed a place for those kids to go so they'd stop saying, "I have to pee." Food is, essentially, the same. If I walk into a Subway in Youngstown, Ohio, I know the menu already. I know what I want and what it's going to taste like. I don't have to stand there trying to decipher a menu I don't know or order something that is vaguely familiar but which the locals just snigger at. "That's for the tourists," they say behind your back. You know that ingredients have been, you hope, supervised by the chain's quality control systems and will taste exactly the same as what you can get at home. For many of us, while we say we are "open to try new things", when faced with Jim and Joe's versus McDonalds, we'll opt for McD's because it's familiar. On the minus side, that uniqueness in cuisine is lost with Culver's every 150 miles or so. There really isn't an incentive to hop off the Interstate and try Jim and Joe's even if the billboard you passed 20 miles back was freshly painted and the sign is still by the exit. We don't go through town anymore on Highway 30. We go by town at 70 mph and may only give the exit arrow a cursory glance. Jim and Joe's may not even exist anymore. I don't remember when the drive in closed. I think it was long after I was gone from Monona. As I think about a day trip here and there while on vacation, I think about where I'm going to stop to eat when it comes that time. Just off the Interstate is not where you're going to find Jim and Joe's. If you're going from point A to point B in the quickest amount of time, the drive through at Wendy's becomes your choice. In, out and back on the highway. You're not inclined to drive 3 miles into town for a "unique" eating experience since your final destination is another 4 hours ahead. When we travel, we tend to fall into two categories, the meander and the straight line. There is room for both. The meander will seek out the Jim and Joe's while the straight line will stop at Culver's and get back on the road. Sometimes, we combine both styles into a trip. And I'm not bemoaning the homogenization of travel eating, don't get me wrong. There is a need for clean bathrooms and quick meal service, something you did not get in the 1960's. Stopping for food is, for me, as much about what I want to eat as what is convenient and what fits with the style of travel. If I have time, Jim and Joe's is very appealing. If I have places to go and people to annoy, I need the drive through. I don't think we'd be happy to go back to the time when the only food available while traveling took you two hours to get and eat. Our palate has changed. Some places have adapted and some have not. I'm going to muse on this over my vacation and I'll be back with some thoughts at the end.